In Superior Court May 17, Debra Turner, who lived with billionaire philanthropist Conrad Prebys for more than 16 years, sued the other board members of the Conrad Prebys Foundation. Turner is president of the foundation, which has not yet been funded. Conrad Prebys, who gave more than $300 million to San Diego nonprofits, died in July of last year. Conrad Prebys disinherited his son Eric in 2014, although Eric didn't know of the action until after the funeral. Eric Prebys's lawyers negotiated a $9 million settlement for him, plus $6 million that would be owed to the Internal Revenue Service. In the suit and in an interview, she argues that the purpose of the foundation is to provide funds for San Diego's nonprofits and not to give money to individuals. She believes that the four other foundation members agreed to give money to Eric because it would protect their own interest in Conrad Prebys's trust. She charges them with breach of fiduciary duty and wants them removed from the foundation. She contends that attorney James Lauth, who handled Conrad Prebys's trusts for many years, negotiated the tax-free settlement for Eric Prebys. Lauth, who did not return calls, is not named in the suit. That award was "wrong morally and legally," she told me, stating that she will get no money even if she wins the suit. In the suit, Debra Turner claims that she is "effectively the Decedent's [Conrad Prebys's] widow." Eric Prebys, who is a noted physicist, told me, "I dispute that she is effectively my father's widow." Conrad Prebys had been married three times before beginning his liaison with Turner. One of the prominent trustees who is sued is Laurie Anne Victoria, who is now chief executive officer of Progress Construction Company, a firm that was a major source of Conrad Prebys's wealth. "Laurie was my father's bulldog, most loyal and most trusted employee. The idea that she would act against his interest is ludicrous. Everything she did was to safeguard his reputation," Eric told me. Supposedly, Conrad took umbrage over remarks Eric had made in conversations in 2014. He believes his father was sinking slowly into mental incompetency two years before his death. Debra Turner disputes that, claiming he did not evince dementia until shortly before his death. Eric has come to believe that Debra Turner does not like him. May 23, 2017 @ 3:10 p.m.
"Eric has come to believe that Debra Turner does not like him." That's about as pithy an understatement as one can make. Turner might have a case, since usually "the purpose of [a] foundation is to provide funds for...nonprofits and not to give money to individuals." But that would require accepting her characterization of this issue being about the disbursing of foundation funds ("which has not yet been funded"), rather than an inheritance dispute about the source of those funds. Even after giving away $300 million, I'll bet $15 million is still chump change to how much is still left in the Prebys estate. So it sounds like to me like Lauth and Victoria made a savvy decision to avoid a far more expensive lawsuit that would have needlessly depleted funds for legal fees that could be used for charity instead—and to do right by his only son. May 23, 2017 @ 7:28 p.m.
May 24, 2017 @ 5:29 a.m. I appreciate your accurate and sane assessment of the situation. Don and I went back and forth about what I was willing to say on the record, and that last line comes from a direct quote - but I'll admit I laughed out loud when I actually read it. Pithy, indeed. May 24, 2017 @ 6:52 a.m.
May 23, 2017 @ 5:43 p.m.
Atta girl! Lawsuits make fees for lawyers and jobs too. No sense wasting the money on charities or, for that matter, settling Eric's claim. No, use it for hired guns to sort out the remaining funds. Sounds as if ol' Eric didn't do too badly. $9 mil, and the taxes on that of $6 mil. Hey, I'd take that deal in a heartbeat. May 23, 2017 @ 7:29 p.m.
May 24, 2017 @ 3:25 p.m.
Eric could have counter-sued Debra Turner and the Estate and potentially forced a much bigger settlement and exposed any alleged wrongdoing in the Administering of the Estate and Estate Funds...It would probably cost him a a few hundred thou to go down that road or more and to take this case to trial depending on investigation and expert witness and attorneys fees. Laurie Anne Victoria is very smart to settle it for a mere 9M+6M to pay Eric's taxes. Sounds like Conrad has a very smart lady running his operations. If Debra Turner "opens the door" by suing and if they find any problems with her handling of Conrad's estate, then 9M will look like "chumps change" and Eric could get much more. Eric probably does not have the appetite for litigation...like many.,,can't blame him...Many are allergic to lawyers and courts. May 25, 2017 @ 7:51 a.m.
May 23, 2017 @ 9:21 p.m. I have a story, but it would be too long to explain it all, not-to-mention, painful. I went through a case, I was the court appointed guardian of my father's estate. My father moved from Southern California back to Texas when he retired. He developed dementia and the Texas Adult Protective Services pretty much made me seek guardianship after my father's physician filed a report that my father no longer had capacity. My father was in the early stages of dementia. He retired in Texas, to be near his 93 and 96 year old sisters. My cousin "Brenda" had already taken over her grandmothers ranch and was looking for her next source of money. My cousin showered my father with attention and painted me as a "snake in the grass." My cousin even tried to get the court to perform a "judicial trust modification" to eliminate me and my half-sister from the trust. When an individual is falling into the darkness of dementia or Alzheimer's, the people closest to them have an out-sized influence on their decisions. In my case, this was a painful distraction. My father was alive and even had to take the stand in cases that my cousin used one of my old aunts as a Trojan Horse lawsuit. Lot's of money was paid out to lawyers and doctors. One expert witness my legal team hired charged $10,000 for two days of "evaluating my father." My father died but the court shenanigans continued. A dance between a greedy cousin and unscrupulous estate lawyers. It just amazes me how greedy people can be. Especially the "companions." They don't earn the money, they just feel entitled to it. May 23, 2017 @ 10:54 p.m.
May 24, 2017 @ 10:08 a.m.
Well it was not that large an estate. A grain of sand on the beach compared to the subject of this story. That was the most frustrating part was why my father established a third-party trust. He was sold on doing that by a stock broker who sold all my fathers blue chips stocks and then bought him annuities. Anyway, my father passed away and that ended the court proceedings. My cousin managed to get paid an allowance for a while when my father was alive. The lawyers collected a substantial amount of money as well. Texas just does things differently. When I tried to move my father from Texas to California, the court refused because my father said he wanted to remain near his sisters. So even though a court has found a person "incapacitated" they continue to treat the individual as if they have capacity. It's emotional enough to have a parent suffer from diminished capacity but then to have relatives (remote ones at that) try to alter estate plans that were put in place, is very frustrating. We don't talk anymore. The cousin didn't get away with all the money, probably because I could afford better lawyers. May 24, 2017 @ 11:37 a.m.
May 25, 2017 @ 7:54 a.m.
May 23, 2017 @ 9:26 p.m.
Wow, the other shoe has dropped. James Lauth sounds like an excellent lawyer and a principled man to have restored Eric Prebys as heir to some part of his dead father's fortune. Doubtless companion Debra Turner does think herself "effectively the Decedent's widow." For years the scary lady's name has been ubiquitous on every donor list in every music or theater program -- right next to the name of Conrad Prebys. I don't recall if you said: did Turner also benefit from Prebys' will? May 24, 2017 @ 6:57 a.m.
May 23, 2017 @ 10:28 p.m.
Well I guess we have the answer to "does she harbor ill will to young Eric?" It would appear she does not like him or she has a pathological need to guard the estate she didn't inherit either. The settlement sounds reasonable enough considering the sums involved. I doubt if his dementia rendered him incompetent all at once at the end, in fact the deterioration tends to be gradual and he was non compos mentis sometime before his physical death. Turner's actions appear malicious on their face but who knows? I'm glad the son got taken care of, he deserved more than the grand kids and senior obviously agreed at some point in his life. May 24, 2017 @ 7:04 a.m.
May 24, 2017 @ 6:17 a.m. In the suit, Debra Turner claims that she is "effectively the Decedent's [Conrad Prebys's] widow." California does not recognize common law marriage. No matter how long you live with someone without the benefit of marriage you can not claim that you are married under common law. Nice try Debra. May 24, 2017 @ 7:11 a.m.
May 24, 2017 @ 10:11 a.m. Painful to remember that my unloving half-brother Brand had his lawyer write a new will and his nanny and groundskeeper (German couple) sign as witnesses. Court hearing notice intentionally mailed late to me, known I wouldn't have money to fight him. I figured out how to represent myself pro-persona for 3 years. Couldn't win, gotta prove dementia, was early Alzheimers. Employees appeared to be just dad's neighbors not controlling drones. Undo influence. I drank, BFD, I didn't steal, that was his game. I had to separate my assets from Executor Ed after mom died and he was pissed. Threatened me with "playing hard ball". He excluded me and my only daughter. He was never an uncle to her or brother to me. My dad and I had been fine. By the bye, Debra is idealizing her concubine status, embarrassing herself. May 24, 2017 @ 11:41 a.m.
May 24, 2017 @ 1:30 p.m.
As an astute businessman, it seems Conrad Prebys would have very carefully selected the members of his initial foundation board to carry on the legacy of his life's work. He undoubtedly deemed them trustworthy and supportive of his values. The amount of his son, Eric Prebys's, inheritance settlement is a mere fraction of the assets of a billion dollar foundation and most likely would have been awarded had the case gone to court. This leads me to wonder what Debra Turner's actual motives are for using her personal resources to sue the volunteer board members monetarily as well as demanding that they all resign for supporting an action they thought was best for the foundation. By the way, Eric Prebys's description of how he was gradually excluded from his father's final years and then blindsided by his disinheritance sounds like a classic case of financial elder abuse. When you look at these two actions together (i.e., attempting to disband the board for making a common sense decision and Eric's disinheritance) something just doesn't smell right to me. May 24, 2017 @ 3:35 p.m.
You are correct...I agree...Trying to get rid of Board Members that DT cannot control...very suspicious.. Isolating the father/family member from his only son and probably limiting access to him and telling him, falsely, that the son does want to see him. This has all the classic signs of elder abuse. May 25, 2017 @ 9:07 p.m.
May 24, 2017 @ 3:40 p.m.
ClaireZ: You are right: Conrad Prebys selected people who had worked for him to serve on the board of the foundation after he died. They had been very loyal to him for years. The foundation is not yet funded; I doubt that it will have a billion dollars. He was a billionaire but gave at least $300 million to charities. If she wins the suit and fires the other board members, she will have essentially complete control of a foundation that that could have hundreds of millions of dollars in it. She says that all that money will go to charities and she will get nothing out of it. I suspect there will be some people who will want detailed proof of that. May 24, 2017 @ 3:13 p.m.
Don, I knew there was much more to this story as I commented and as we discussed in your previous article on the disinheriting of Conrad's son Eric. As I suspected, Debra Turner, the companion, has apparently, come between the father Conrad and his Son Eric and the Grandsons. It is a classic case and happens very frequently. I don't know why Debra Turner, allegedly, turned the father against the son. (Probably for financial reasons and to keep most of the cash to herself...as is sometimes the case..greed trumps family). If she is dumb enough to sue on this settlement deal, then many more of these "facts" will be revealed in depositions and the course of the trial, if a trial occurs. If Debra Turner wants to keep Conrad's and her business quiet, then she should not be suing in a public court of law. I suspect that the supposed insults from father to son may either have never happened, OR were exaggerated by Debra Turner to Conrad, OR Conrad was losing his facilities and Debra Turner used Conrad's decline to plant mistrust and a breach between father and son OR a little of all of the above. Keep Digging my friend. You may have helped Conrad's son and Grandsons recover the inheritance from Conrad that they were, allegedly, cheated out of by the companion. May 24, 2017 @ 3:55 p.m.
SportsFan0000: Of course there is more to this story. Debra Turner guaranteed that this will be front and center by filing that lawsuit in the last few days. I don't know that your suspected scenario is correct, but it is certain that some very intelligent people believe it is, or is close to the truth, anyway. Call it "verisimilitude," in many people's minds. Here is a statement on this topic by Eric Prebys: "This is a simple statement of fact. Her lawsuit seeks to remove all board members besides herself. Of course, they will need to be replaced, but if she is allowed to choose the new members, she will have the freedom to choose people unlikely to go against her wishes, effectively removing any checks and balances. My father chose the current board members before his diagnosis, when there is no question that he was in full possession of his mental faculties. He obviously had reasons for doing so, and I feel that his wishes should be respected in this matter." May 25, 2017 @ 8:01 a.m.
May 24, 2017 @ 3:38 p.m.
Don, this sounds like the sad case of Casey Kasem as you may recall. May 25, 2017 @ 8:03 a.m.
May 24, 2017 @ 7:37 p.m.
Wow, this has been a very technical and emotional string of postings, all at once. SportsFan is obviously far more than just a sports fan (lower case.) I'd guess he/she is an attorney, or should be one. Ponzi has my full sympathy. I avoided anything like he had, but any estate can blow up into a full-on mess. Isn't there a better way to handle these things? (To answer my own question), Yes there is, but we all might not like it if the government got into it. May 25, 2017 @ 8:09 a.m.
Visduh: Through the years there have been many stories of beautiful young females who married a very old man and got him to change his will to give the family money to her. The sons and daughters who lost the cache often sued, leading to wild lawsuits with newsworthy revelations. Young men have done the same, marrying very old women and raking in her money. May 25, 2017 @ 8:35 a.m. Seems she thought she had it all figured out and under control, vicious nutty B with a greedy itch riding his gravy train. May 25, 2017 @ 3:38 p.m.
May 25, 2017 @ 1:32 p.m. So Rene Descartes walks into a bar and orders a drink. When he finishes his drink, the bartender asks him if he would like another. Descartes replies, "No, I think not" and disappears in a puff of logic. May 25, 2017 @ 3:40 p.m.
shirleyberan: Every day a guy walked into a bar and ordered two martinis, telling the bartender, "One for me, and one for my friend in Afghanistan." This happened for months. Then he walked in and ordered one martini. Said the bartender, "Oh goodness. Did your friend die in battle?" May 25, 2017 @ 8:01 p.m.
Glad to see some humor in the comments. Here's mine. Years ago my doctor told me I was drinking too much and should only have one drink a day. I said fine and found a nice place in Old Town to enjoy my daily cocktail. May 25, 2017 @ 9:10 p.m.
May 26, 2017 @ 6:09 a.m.
May 26, 2017 @ 1:32 p.m. I really believe the potential and probable ramifications of Debra Turner's lawsuit warrants discussion in this forum. Her need for "retribution" against the board members and trustee for what seem to be common sense actions should have community nonprofits that stand to benefit, if not depend, on foundation grants very concerned. 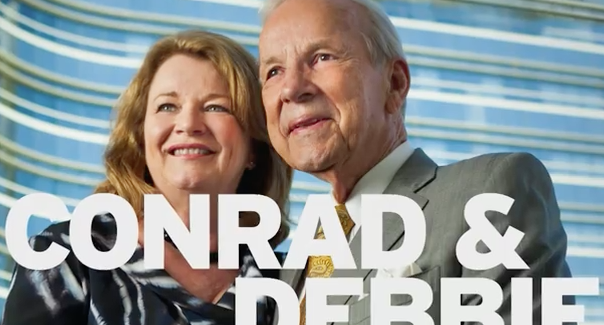 The monies Conrad Prebys has donated in the past have provided substantial support to many of our community's most valuable charities and institutions. If the City of San Diego follows through on recent threats to considerably reduce it's financial support for these organizations, their well being and perhaps very existence will depend even more on charitable donations and grants. This potential loss of funding not only affects those who benefit from the work they do, but also those whose livelilhoods depend on running, performing and providing their services. A lengthy lawsuit which may become significantly more far reaching than it now seems will only delay, if not outright defeat, the purpose of Mr Prebys's formation of his foundation. He established his foundation to nourish in many ways the community that enabled him to become so successful. I've often read that he did this with much joy and felt in his later years this was his greatest accomplishment of all. To me, it's incomprehensible that one individual feels entitled to wreak this much havoc on so many people for what seems to be little more than a need to fulfill her vision of her own standing in this community. What would Conrad say? Debra Turner should give some serious thought to the overall effect her actions will have not only on herself, but on the community as a whole. May 26, 2017 @ 3:20 p.m.
ClaireZ: I agree with you. Debra Turner should reconsider this lawsuit. If the other board members choose not to fight it, and leave her alone at the top, a possibly dangerous situation is created. May 26, 2017 @ 2:11 p.m.
Nobody knows what is in the heart of a partner but there is a possibility there is a wish for his death to make it easier/better for her, not only in fiction. May 26, 2017 @ 3:21 p.m.
May 26, 2017 @ 2:21 p.m.
Don, if Debra Turner is trying to fire the complete Board of Directors of Conrad's Foundation and then install a New Board Members who are handpicked rubber stamps of only her wishes, then something is very rotten with the foundation, and perhaps, the Estate. I don't know how much $$$$ that Conrad bequeathed to the foundation or whether it will or must be disclosed to the public?! Will Debra Turner be drawing a large salary from the foundation?! Will Debra Turner have unlimited, unfettered access to the Foundation's money through her New "Rubber Stamp" Board of Directors?! Are the Board Members appointed by Conrad and/or the community planning on challenging Debra Turner's actions?! What other government regulatory bodies are involved or should get involved in this matter?! Please advise. Thanks! May 26, 2017 @ 3:27 p.m.
June 8, 2017 @ 3:17 p.m.